Japan tried to negotiate the first trans-Pacific trade agreement exactly 400 years ago. It sent a robed samurai, Hasekura Tsunenaga, to Europe via Acapulco to request the right to trade directly with New Spain (today’s Mexico). Among other things, he needed permission from the pope. But because the shogun was slaughtering Catholics at the time, he did not get it. Only in the past decade have such agreements finally started to flourish. But they are still dominated by interests that go beyond the nuts and bolts of trade and into the realm of geopolitics. America and China are pursuing three separate tracks towards trade pacts that would help define the future of trans-Pacific commerce. One of the three does not include China, another excludes the United States. The third is still pie in the sky. All three involve unwieldy acronyms, though whichever wins could one day become as familiar as NAFTA (the North American Free-Trade Agreement). The furthest advanced is the American-led Trans-Pacific Partnership (TPP), in which China plays no part. On a parallel track, though further behind, is the Regional Comprehensive Economic Partnership (RCEP), which covers only Asian countries and includes China, plus several countries that are also negotiating the TPP. Kevin Lamarque/ReutersU.S. 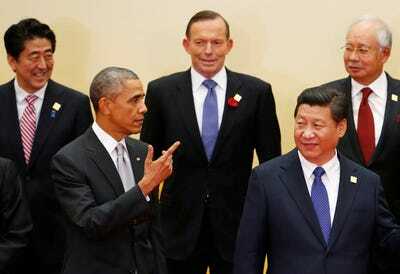 President Barack Obama (C) meets with the leaders of the Trans-Pacific Partnership (TPP) countries in Beijing November 10, 2014. The distant dream is the Free-Trade Area of the Asia-Pacific (FTAAP), which would include both America and China, and possibly cobble together elements of both TPP and RCEP. 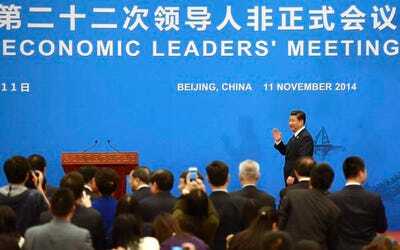 China pushed the FTAAP ahead of the 21-country APEC summit in Beijing in November, giving a new lease of life to an old idea. As trade experts see it, the TPP is the most ambitious in the short term. It is dominated by America and Japan and also includes Australia, Brunei, Canada, Chile, Malaysia, Mexico, New Zealand, Peru, Singapore and Vietnam. Together these countries account for about 40% of global GDP, making it one of America’s biggest potential free-trade agreements (FTAs). The Obama administration hopes that it would be complemented by an even more ambitious agreement with the EU. America, which already has FTAs with six other TPP countries, sees opening up Japan as the big prize. But the TPP is not just aimed at dismantling tariff barriers. It is also meant to tackle tough issues such as intellectual property, services, government procurement, labour and environmental standards. Since its members include economies such as Vietnam and Malaysia whose supply chains depend on cheap labour, negotiations were always likely to be tricky. Goh Chai Hin/Pool/ReutersChina’s President Xi Jinping arrives for a news conference for the Asia Pacific Economic Cooperation (APEC) Summit at the International Conference Center in Yanqi Lake, north of Beijing, November 11, 2014. When Japan, which likes to spoil its farmers, joined in 2013, they became even trickier. But after 19 rounds of negotiations, considerable progress has been made. There is a strong push to finish it by the end of this year, though a similar deadline last year was missed. RCEP, which is led by ASEAN, has the unenviable task of bringing China and Japan to the same table. It is more focused than TPP on market access and on smoothing the way for supply chains. But it includes foot-dragging India, and may suffer from ASEAN’s softly-softly way of negotiating by consensus. Michael Froman, America’s trade representative, says the TPP is about ensuring high labour standards, exposing state-owned enterprises to level competition with private enterprises and including digital activity “to ensure a free and open internet”. When he held informal talks with TPP counterparts at a get-together in Myanmar in August, he asked them about RCEP and was not impressed by what he heard. Whereas the TPP was aiming to eliminate almost all tariffs, India was asking RCEP to keep the figure as low as 40%. China was somewhere in between, apparently waiting to see where everyone else ended up. Predictably, in the run-up to the 21-country APEC summit in Beijing this month, America and China have also been at odds over the FTAAP plan being promoted by the Chinese. Wang Shouwen, China’s deputy trade minister, has memorably described the TPP and the RCEP as “two wheels of a bicycle”, and the Obama administration has been heartened to find that the Chinese government no longer dismisses the TPP as an anti-China ploy. But APEC insiders say that American officials have opposed China’s plan for an FTAAP feasibility study, and they disagree over timing. As one official says, America is “dead set on achieving a breakthrough on TPP” and does not want to be distracted by FTAAP. They also differ over which should be the FTAAP’s main building block. Eventually America would like to bring China into the TPP and use that as the basis for a highly sophisticated trans-Pacific FTA. 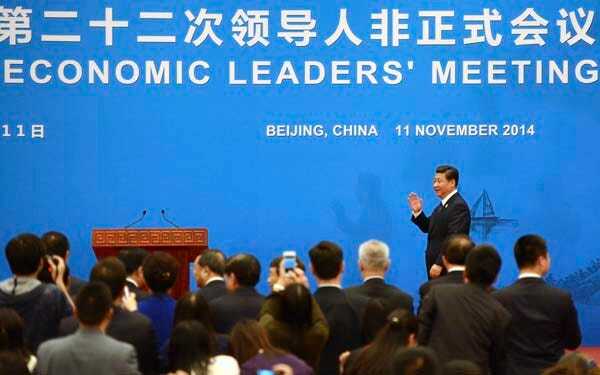 But China will be reluctant to accept American rules on things like state-owned enterprises and internet access. 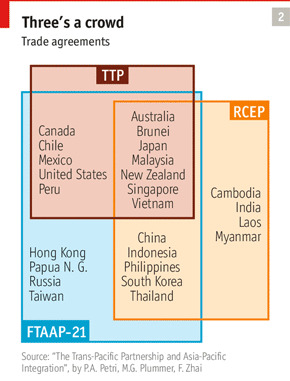 Going down an RCEP route would give it more say. Messrs Petri and Abdul-Raheem think that a trade agreement between America and China would bring big gains, whatever the route. But they reckon that a more rigorous TPP-style model would bring economic benefits worth almost $US1 trillion more than one based on RCEP, though it would be much harder to persuade China to go along with it. Yet the TPP itself still has huge hurdles to overcome, mainly political rather than technical. The Obama administration’s main headache–some say self-inflicted–is another acronym, Trade Promotion Authority (TPA). This enables the American government to negotiate free-trade agreements without having them picked apart afterwards; Congress can only validate or reject en bloc what has been negotiated. 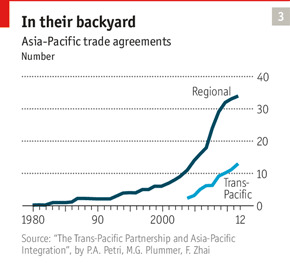 Once called “fast track”, TPA lapsed for new trade agreements in 2007. Since 2012 the White House has been seeking renewal, but even its own Democrats on Capitol Hill have stonewalled. Japan’s obstacles are more elegiac than TPA, but just as stubbornly entrenched. They have to do with rice and other “sacred” products of the land, such as wheat, beef and pork, dairy and sugar. Japanese farmers are few and far between, and most of them are getting on in years, but as guardians of the nation’s most cherished harvests they yield to no one. Backed by JA, a vast Tokyo-based farm lobby, they have spent their lives resisting efforts to lower tariffs on such products. Richard Katz, an economist, says that their rural toils produce just 0.8% of Japan’s GDP, yet they match America’s Congress in holding TPP hostage. In September, just days after Mr Abe reiterated in America that TPP was crucial for raising Japan’s agricultural competitiveness and helping it adjust to an ageing society, TPP talks between the two countries abruptly broke down. Each side blamed the other, though Americans continue to suspect that the problem is not Mr Abe’s own commitment but the weight the farmers carry with his bureaucrats. The Japanese, for their part, realise that their best offer may never be good enough for Congress, so without TPA there is unlikely to be TPP. 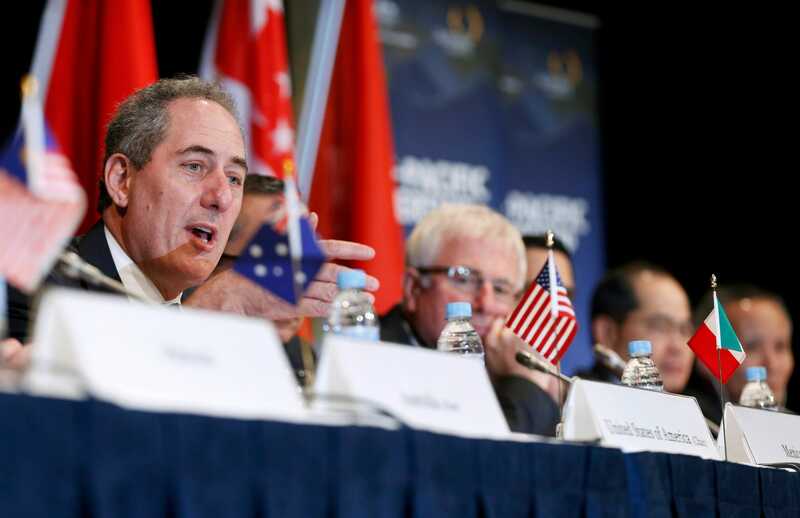 At a time when there is uncertainty about the direction of the global trading system, TPP can play a central role in setting rules of the road for a critical region in flux,” he says. The flipside of this is that failure becomes an even bigger risk, which Mr Froman acknowledges. Perhaps in an effort to prod a somnolent, introspective Congress into action, he makes the dramatic claim that failure could mean America “would forfeit its seat at the centre of the global economy”. Many pundits in Washington agree that American leadership in Asia is on the table. Michael Green of the Centre for Strategic and International Studies says TPP failure would “undermine the impression of the United States as a Pacific power and look like an abdication of leadership”. It would also take pressure off Japan and China to reform their economies. Mireya Solís, a Japan expert at the Brookings Institution, says it would be a “devastating blow to the United States’ credibility”. Those views are echoed in East Asia. Mr Tay in Singapore says TPP failure would be a disaster: “If the domestic issues of these two countries cannot be resolved, there is no sense that the US-Japan alliance can provide any kind of steerage for the region.” Deborah Elms, head of the Singapore-based Asian Trade Centre, suggests that so far the American pivot has manifested itself mainly as an extra 1,000 marines stationed in Australia. “Without TPP, all the pivot amounts to is a few extra boots on the ground in Darwin,” she says. 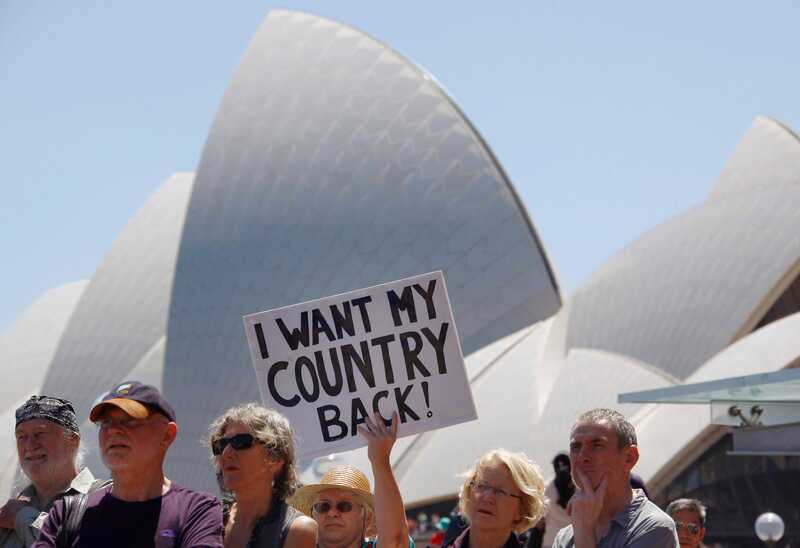 David Grey/ReutersA protester holds up a sign in front of the Sydney Opera House during a demonstration against the Trans-Pacific Partnership (TPP) trade agreement November 8, 2014. Yet when Mr Obama mentions TPP, he talks mostly about protecting American jobs rather than safeguarding America’s place in the world. The president has never fully put his back into forcing a congressional vote on TPA. There is still time for him and Mr Abe to rescue the trade talks. But unless Mr Obama leads from the front, America’s own leadership in the Pacific will seem less convincing than he has repeatedly promised.